Classic and timeless, and simple and chic curb chain necklet will always be in style. This curb chain is crafted from 9ct yellow gold and measures 20". Wear alone for a minimalist look, or combine with other pieces to enhance your own unique sense of style. 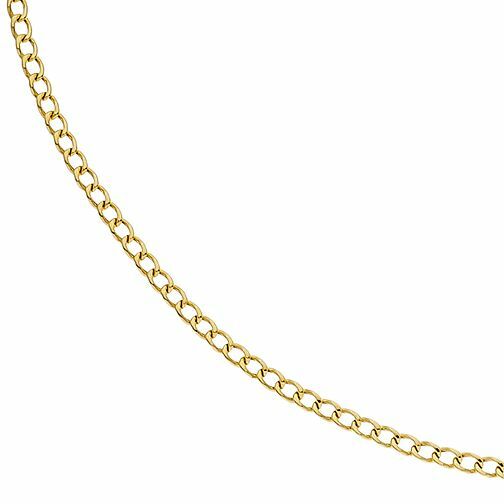 9ct Yellow Gold 20" Curb Chain Necklet is rated 5.0 out of 5 by 1. Rated 5 out of 5 by Anonymous from Nice, affordable chain I bought this chain to go with my St Christopher pendant as the previous chain was far too thin for a bloke. This chain is just right....blokey without being a Mr T cast off. Equivalent chain at every other store I went in was priced at around £200 so a massive saving too.